Have you heard of tree tents? If not, you’re missing out on one of the coolest travel accessories for your adventure. Call it crazy, cool, or anything in between. But we’re calling it a camping revolution. The best tree tents offer something that your standard camping tent doesn’t. Yes, it’s the obvious answer - elevation from the ground. But beyond that, you get to experience the outdoors in an entirely new way! Just remember that before you try to step outside your door in the a.m. Without further ado, we’re going to show you some of our favorite picks for the best tree tents on the market. Are you ready? What Exactly Is a Tree Tent? Have you ever heard of tree tents before? They are camping tents (and in some cases covered hammocks) set above the ground. To set them up, tie them to neighboring trees. 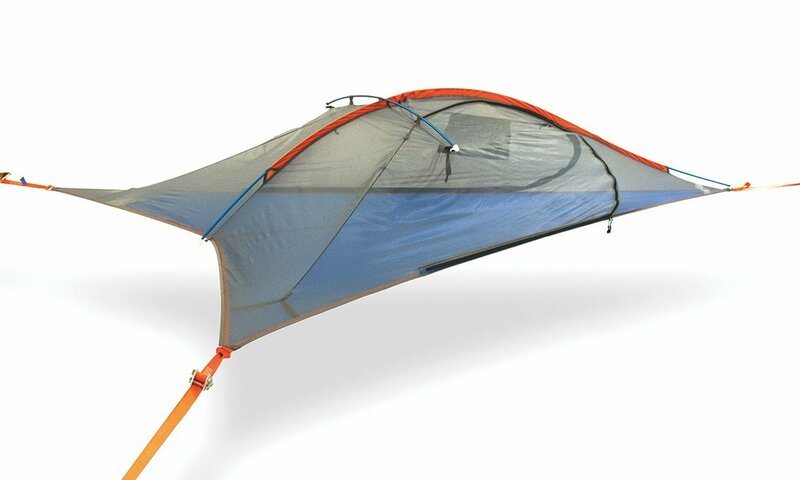 Like a regular tent, you have complete closure that can house you and your gear while you're suspended off the ground. If you need a starting place, then it will help you to begin by considering a couple of questions. When looking for the best tree tents, there are some questions to ask yourself. They will point you in the right direction. Knowing your budget will be key to finding the perfect gift tree tents. Whether you are looking for a small style or one that can accommodate more people, knowing your budget will help narrow down your options.There are options on this list just a little over $20 and others over a couple hundred dollars. We suggest approaching this guide with a price limit in mind. 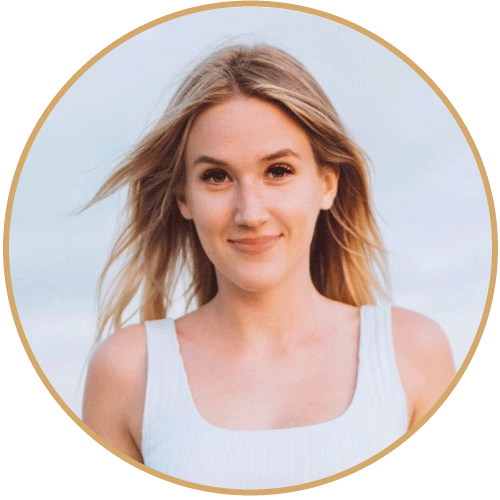 That way, you will be able to knock off all the items that are out of your price range much faster and, subsequently, locate the best tree tents that much faster. There are so many travel items and accessories on the market today. We understand how easy it is for indecision to strike when trying to choose the right travel accessory. That's why we're here to help ease the process. Of all the tree tents, this is the most advanced two-person one on the market. Lightweight and portable, it’s perfect for bringing on backpacking trips and adventuring deep into the heart of the woods. It’s worth it to find that perfect camping spot, right? So, how does it stay in place? Well, a cross brace creates the extra space for headroom. The Tentsile Flite Plus is a bit more spacious than its predecessor. So it doesn’t come with a ton of extra weight, it comes with only one ratchet. But the good news is its handy size means it can be set up between most types of tree configurations with relative ease. You won’t have trouble finding a spot to secure it - even in the most dense of forests. Looking closer at the specific features, we found quite a few we appreciate. 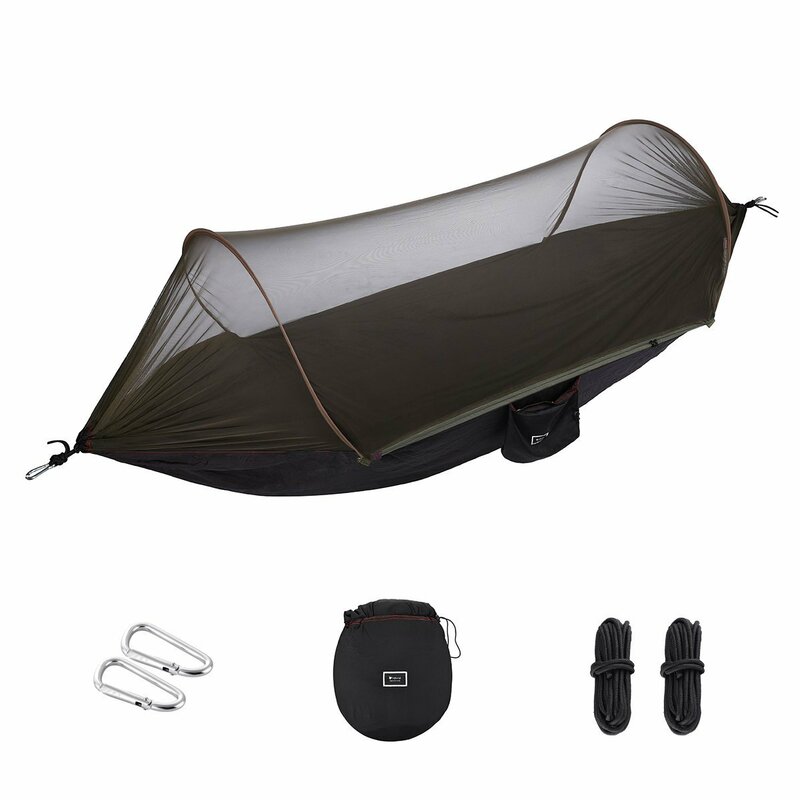 The Flite Plus comes equipped with a full insect mesh top with two doors. There’s also a removable rain fly you can take off and catch the most incredible views. When you’re not using them, simply fold the rain flaps underneath the tent and hook them to each other. This creates another wind break as well as a thermal buffer. It only takes ten minutes to set up. Due to its size, the tent is best suited for individuals under 6’1” and 485 pounds. For a more spacious model, take a look at their Connect Tree Tent. While it doesn’t technically fall into the categorization of tree tents, the isYoung Hammock is still worth a look. This travel hammock offers the perfect space for relaxing; string it up anywhere and everywhere. Made from a durable parachute nylon fabric, it is strong enough to hold two people (up to 440.9 pounds). There are so many features that we love about it. The first thing that comes in handy is the breathable, antibacterial fabric. Besides keeping you cool and fresh, smooth reverse zippers work to open or close the mosquito net and keep bugs out. 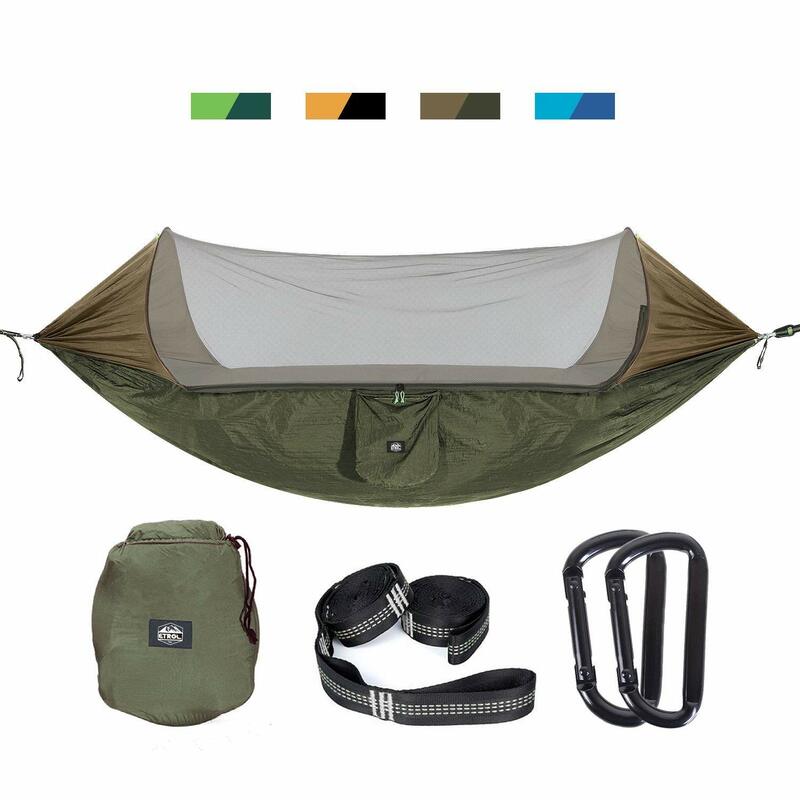 Better yet, it’s multi-functional, working as a tent, hammock, sleeping bag, or swing. When you’re ready to pack up and move to your next spot, simply flatten the hammock and gather it. Put the stray bars in the bag, place the hammock and ropes in, and synch the bag shut. Of all the tree tents on the market, the Lawson Hammock Blue Ridge is at the top of our list. Thanks to its unique hybrid design, it has been voted as one of the best hammocks by leading publications. It’s the perfect portable design for travelers who like to go a little off the grid. A spreader bar and pole arch system keep the hammock flat and taut, eliminating that uncomfortable cocoon effect. With attached bug netting and a rain fly, you have all the protection you need. There’s no reason to have to tie additional tarp or staking. With the use of the arch poles, you can also use it as an open / regular hammock for lounging in the sun. With the Lawson Hammock Blue Ridge, you get the best of all possible worlds. This versatile sleep system can act as either a sleeping bag or a hammock. First, you will set up two arching poles for the mosquito net and rain fly. At both ends of the tent, the arched poles can be lifted to form an elongated dome tent. You’ll have enough room in here to sit up if you’d like or move around to get something out of your bag. Next, a unique bar system attaches to the ropes at the end of the hammock and spreads out over a flatter area. This not only helps to keep the floor more stable but it also reduces the hammock sag. When you pitch the tent on the ground first, it comes together to create one of the best small tree tents. Lightweight and durable, it’s easy to set up and is perfect for all types of camping. If you’re looking for a good quality budget buy, you won’t find a better option than this Lawson hammock. Included in the box, you will get a rain fly, poles, storage, and ceiling o-rings. The waterproof ripstop fabric and full-coverage rainfly offer support and protection from the elements. In addition, no-see-um mosquito netting keeps all the annoying bugs out. This hammock and all of its contents are easy to pack and unpack from the stuff sack. When you’re all set up and ready to hit wind down, feel free to use the two interior storage pocket or attached o-ring for a reading light. Designed for travel and camping enthusiasts, this is one of the tree tents you need to add to your outdoor survival kit. Made from a high-quality 210T nylon, this super lightweight fabric can hold an astonishing amount of weight - up to 660 pounds. One of our favorite features is its portability. It comes with everything you need to set up shop all in one convenient package. Thanks to a breathable bug net design, you can rest easy and sleep right. 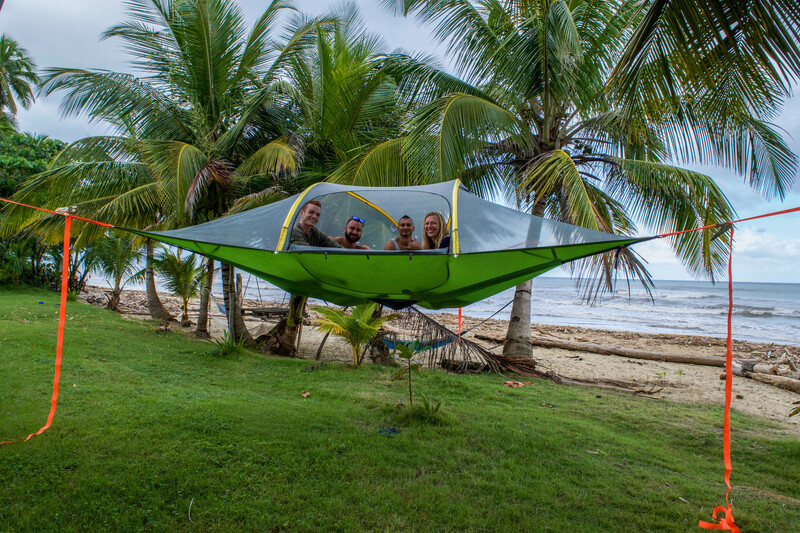 Outfandia makes the best hammocks and tree tents using a high density polyester mosquito net. All of their items come with a 100% refund promise if you are not satisfied with their goods. 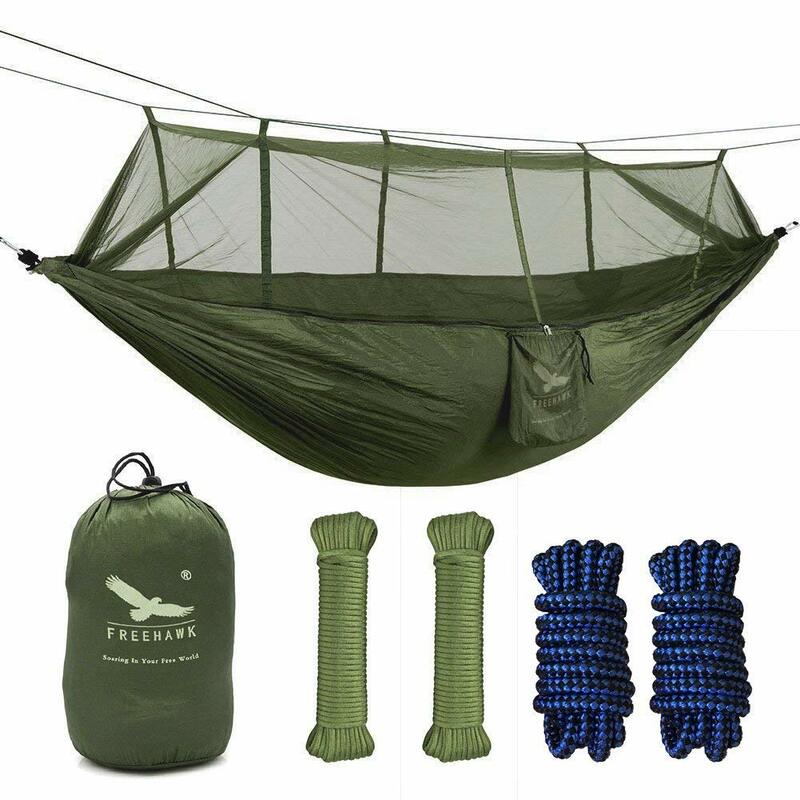 This lovely two in one camping hammock comes fully equipped with a pop up insect net design. Lightweight and compact, it is the perfect size for your camping, backpacking, hiking, travel, boating, and everything else outdoor journey needs. Made from a strong 70D nylon fabric, it’s soft to the touch and great for a good night’s sleep. In your set, you will receive a camping bag with bug netting, two solid steel carabiners, two strong tree ropes, and one storage bag. The Etrol has a 400 pound capacity. We hope you enjoyed reading our feature on the best tree tents selection. As you can see, there are various types of tents to meet your needs. Whether you’re traveling solo, looking for something small and affordable, or a tent that can fit the whole family, you’ll find it on this list. All of the tents we included are durable and easy to assemble.